Most window frames are made from four materials: wood, vinyl, aluminum, and fiberglass. Of these vinyl and wood windows are probably the weakest. They are more malleable and would take less effort to force open. Aluminum and fiberglass windows are stronger and more rigid. This makes them durable and long lasting windows, but also makes them more difficult to dent, warp, or break. There are so many windows styles on the market. Which ones are the most secure? Most professionals point to casement windows. These windows hinge to one side and open outward. But the locks, latches, and crank are all inside. If you keep these windows closed and locked they are very difficult to force open from the outside. Other good options for security include picture windows, awning windows, and hopper windows. 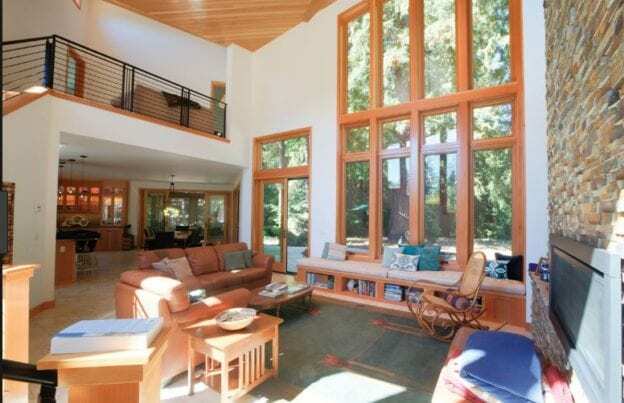 Sliding windows, single hung windows, and double hung windows are all popular styles. And while they are still fairly secure, they don’t perform as well as the other styles. Obscure glass makes it impossible for outsiders to see inside your home. This is a huge deterrent for thieves because they can’t window shop before burglarizing the home. You can find applications at the hardware store to install on your current windows. Or you can invest in etched glass. Unfortunately, this also means you cannot see out. So most homeowners only use opaque glass on bathroom and bedroom windows to ensure privacy. Most modern windows feature laminated glass. Instead of breaking into large, dangerous shards on impact, the glass breaks into small, less harmful pieces. But manufacturers can also add an interlayer of polyvinyl butyral (PVB) between two layers of glass to make a single pane. The interlayer keeps the window largely intact, making them almost impossible to break through. Locks, latches, and other hardware have also come a long way. These accessories are stronger and more secure than ever. And if the old locks on your windows don’t work properly you can swap them out, or invest in additional locks for added security. Some homeowners go as far as adding security bars on their windows if they live in an area known for theft and burglary. To boost security with replacement windows in Phoenix, AZ contact Freelite Inc. Our experts can walk you through the pros and cons of different features and help you choose the best products for your home and your safety. Stop by 331 W. McDowell Rd., Phoenix, AZ 85003 or contact us at (602) 233-1981 to set up an appointment. This entry was posted in Freelite Blog on March 18, 2019 by Freelite Blog.